Yu-Gi-Oh! TCG Strategy Articles » Shadows in Valhalla – 2nd Look – Ninjas! Home > Beginner Tips, Special, What's New? > Shadows in Valhalla – 2nd Look – Ninjas! Shadows in Valhalla – 2nd Look – Ninjas! 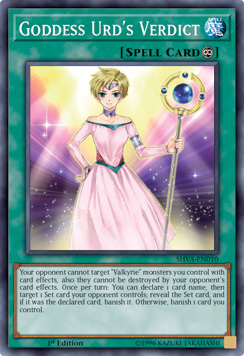 Yesterday we looked at the new Valkyrie cards from the KC Grand Prix anime episodes. Today we look at the new Ninjas coming soon in Shadows in Valhalla! 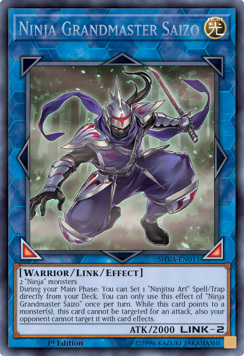 Ninja Grandmaster Saizo is the Ninjas’ new Link Monster, who searches out “Ninjitsu Art” cards and can use his stealth to avoid getting wrecked. During your Main Phase: You can Set 1 “Ninjitsu Art” Spell/Trap directly from your Deck. You can only use this effect of “Ninja Grandmaster Saizo” once per turn. While this card points to a monster(s), this card cannot be targeted for an attack, also your opponent cannot target it with card effects. Meanwhile, it’s 2018, so everybody needs a Field Spell, right? Hidden Village of Ninjitsu Arts lets you retrieve and protect your Ninja and Ninjitsu Art cards. If a “Ninja” monster is Summoned to your field: You can target 1 “Ninja” monster or 1 “Ninjitsu Art” card in your GY; add it to your hand, but you cannot activate cards, or the effects of cards, with that name for the rest of this turn. 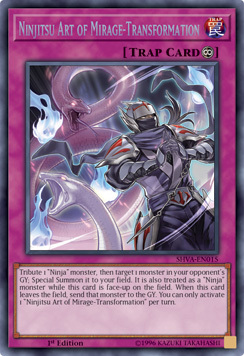 If a “Ninja” monster(s) or “Ninjitsu Art” card(s) you control would be destroyed by battle or an opponent’s card effect, you can banish 1 “Ninja” monster from your GY instead. You can only use each effect of “Hidden Village of Ninjitsu Arts” once per turn. 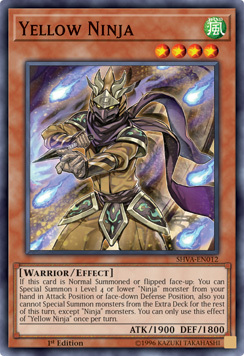 Tribute 1 “Ninja” monster, then target 1 monster in your opponent’s GY; Special Summon it to your field. 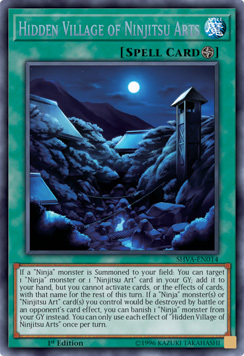 It is also treated as a “Ninja” monster while this card is face-up on the field. When this card leaves the field, send that monster to the GY. You can only activate 1 “Ninjitsu Art of Mirage-Transformation” per turn. Ninjas in the Yu-Gi-Oh! TCG have always been associated with their colorful costumes. Yellow Ninja gives you an opening play to get 2 Ninjas on the field so you can Link Summon quicker. If this card is Normal Summoned or flipped face-up: You can Special Summon 1 Level 4 or lower “Ninja” monster from your hand in Attack Position or face-down Defense Position, also you cannot Special Summon monsters from the Extra Deck for the rest of this turn, except “Ninja” monsters. You can only use this effect of “Yellow Ninja” once per turn. And finally, there’s the latest heavy hitter, the Yellow Dragon Ninja. Cannot be Special Summoned, except with the effect of a “Ninja” monster or “Ninjitsu Art” card. Once per turn (Quick Effect): You can send 1 “Ninja” monster and 1 “Ninjitsu Art” card from your hand and/or face-up field to the GY, then target up to 2 Spells/Traps on the field; destroy them. 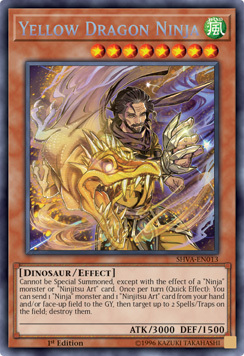 As with other high-Level Dragon Ninja monsters, you can either Tribute Summon Yellow Dragon Ninja, or Special Summon him with a Ninja (Twilight Ninja Getsuga, the Shogun, or Senior Silver Ninja), or a Ninjitsu Art (Ninjitsu Art of Duplication, or Ninjitsu Art of Super-Transformation – for which you can use your opponent’s card on their field). Yellow Dragon Ninja’s effect uses 2 cards to destroy 2 cards. It’s a great combo with Ninjitsu Art of Mirage-Transformation, since you can use the wanna-be-Ninja as the Ninja part of the cost, and the Ninjitsu Art card itself as the second part of the cost. These 5 new Ninja & Ninjitsu cards will give a nice boost to every Ninja Duelist out there looking for new ways to strike from the shadows, to win without mercy, to be sneaky and devious! Glory to the Ninjas! AND, as promised, here are the last 3 cards from Zigfried’s Valkyrie Deck. As on the anime, you can use these to manipulate the top cards of your opponent’s Deck, Set them, and then banish them. In addition to keeping your opponent’s best cards always out of reach (by burying them 2 or 3 cards down), you can pump up Valkyrie Dritte’s ATK by banishing more and more of your opponent’s monsters. Use these cards in sequence to decide the top card of the opponent’s Deck with Skuld, Set it with Verdande, then banish it with Urd. Urd also protects your Valkyrie monsters from card effects! 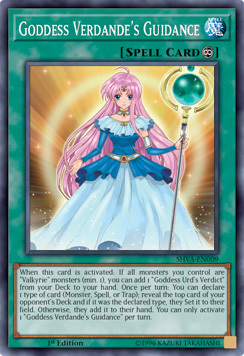 When this card is activated: If all monsters you control are “Valkyrie” monsters (min. 1), you can add 1 “Goddess Verdande’s Guidance” from your Deck to your hand. Once per turn, during your Main Phase: You can look at the top 3 cards of your opponent’s Deck, and if you do, place them on top of their Deck in any order, but you cannot Normal or Special Summon monsters for the rest of this turn, except Fairy monsters. You can only activate 1 “Goddess Skuld’s Oracle” per turn. 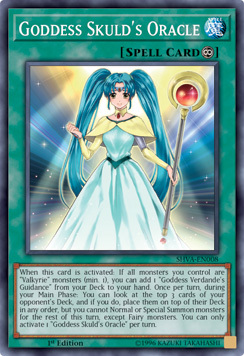 When this card is activated: If all monsters you control are “Valkyrie” monsters (min. 1), you can add 1 “Goddess Urd’s Verdict” from your Deck to your hand. Once per turn: You can declare 1 type of card (Monster, Spell, or Trap); reveal the top card of your opponent’s Deck and if it was the declared type, they Set it to their field. Otherwise, they add it to their hand. You can only activate 1 “Goddess Verdande’s Guidance” per turn. Look for Shadows in Valhalla in 2 weeks, on August 17th! Shadows in Valhalla: From Beyond Shadows in Valhalla – 1st Look!